When you are making the different cake layers, make sure that you let the cakes completely cool. So be patient! If you layer the cakes with the frosting and they are still warm you will see that the cakes will crumble. I mean it’ll still taste delicious, but won’t look very pretty. Believe me, I know. I learned the hard way! If you are a peanut butter and chocolate fan then this is the cake for you. It looks beautiful and fun and is also delicious to eat! Your friends and family will be in love with this cake! This cake is seriously dangerous! I could eat the whole thing! Center a rack in the oven and preheat the oven to 350°. Butter two 9×2” round cake pans, dust the insides with flour, tap out the excess and line the bottoms with rounds of parchment paper. Place the pans on a baking sheet. To assemble the cake, place one cake layer on a cardboard circle covered in foil. 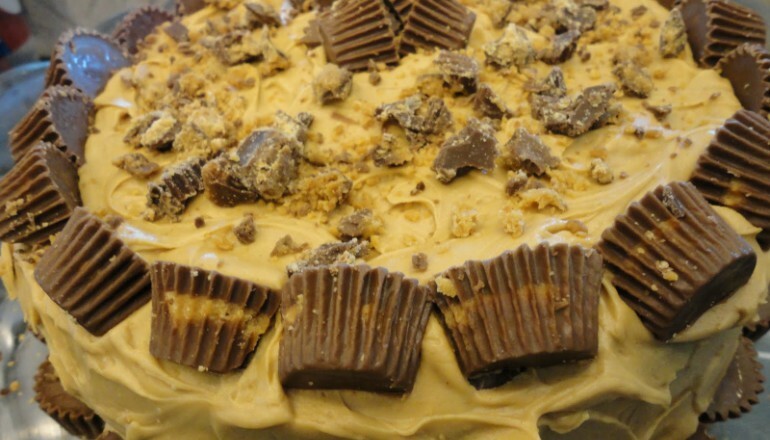 Spread peanut butter frosting on top of the cake layer. (If desired, sprinkle with chopped Reese’s cups.) Place the second cake layer on top of the frosting. Frost the top and outside of the cake with remaining peanut butter frosting. Decorate with halved and chopped Reese’s cups as desired. Quick Tip: Serve with a tall glass of frosty milk! Thanks again to Landon And Tamara for this amazing recipe. Good Golly, You Must Try This Hot Tamale Dip! Macaroni With 4 Different Cheeses? It’s Going On My Table Tonight!